"Until you next play a card not named "Shard of Patience," all your creatures gain +1/+0, +2/+2 if water type." This would allow for multiple patiences to be played, as I honestly can't see it being useful if they don't stack. Zanz changed the old music to jmizzle's composition because jmizzle's was better and more fitting. That's the only reason as far as I know. Note that the woodpecker would feed before it attacks, ideally. Not sure if this is possible codewise. Yeah, I know these cards will both probably need balancing with regards to damage/health. Turn 2: 4 Damage total, 19 health. Turn 3: 12 Damage total, 15 health. Turn 4: 24 Damage total, 7 health. Turn 5: 40 Damage total, 0 health. Turn 2: 8 Damage total, 17 health each. Turn 3: 24 Damage total, 9 health each. Turn 4: 48 Damage total, 0 health each. Turn 2: 4 Damage total, 23 health. Turn 3: 12 Damage total, 17 health. Turn 4: 24 Damage total, 8 health. Turn 5: 36 Damage total, 0 health. Turn 2: 8 Damage total, 20 health each. Turn 3: 24 Damage total, 8 health each. Turn 4: 36 Damage total, 0 health. So yeah, obviously needs some balancing. 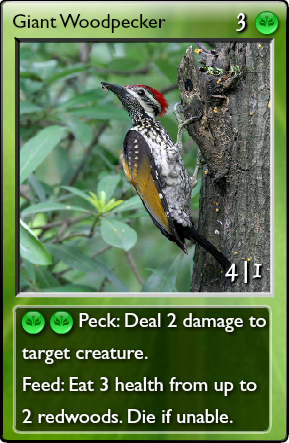 Maybe make them deal the same damage to redwood as their attack, and change the giant woodpecker to 3 attack. 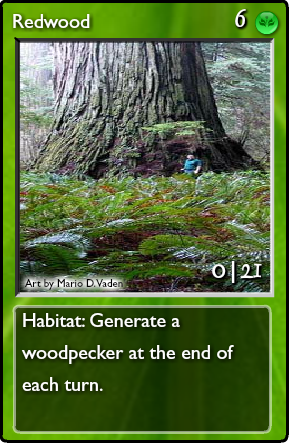 Habitat: Generate a woodpecker at the end of each turn. 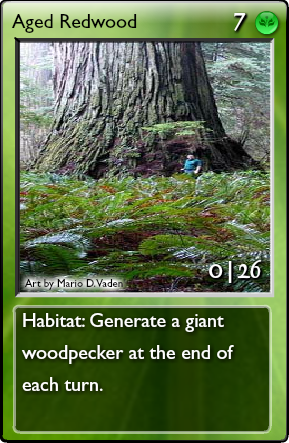 Habitat: Generate a giant woodpecker at the end of each turn. Mono life creature spam generator... except the creatures die as soon as they kill off the generator. Peck: Deal 1 damage to target creature. Feed: Eat 2 health from up to 2 redwoods. Die if unable. 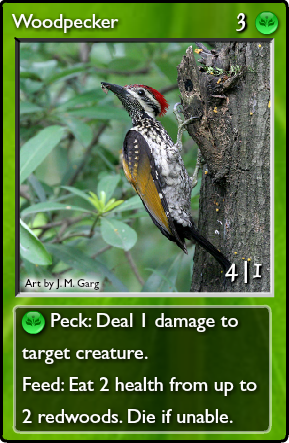 Peck: Deal 2 damage to target creature. Feed: Eat 3 health from up to 2 redwoods. Die if unable. Each woodpecker will hurt two redwoods on your side if they're available. If they aren't available it will make do with a single. If there's not a single one it dies. I highly doubt this card was simply intended as a counter to SoX. As it is, it does need a buff, but it has its place in some scorpion decks or mono water (as in, 6x physalia, 6x crawler, 6x SoP, 2x congeal or permafrost or something, and 10x tower, death mark). I don't think comparing a permanent control card to a creature control card is entirely prudent; they are completely different and effect completely different groups of cards. For instance, you can only have one shield or one weapon out at a time, while you can have multiples of the same creature. And for some key permanents decks rely on only having three since they only need one. It's much different. Plus this card has more attack and defense (granted, +1/+1) and the song of winter passive ability to trump the octopi on, so it's a push at best leaning towards needing another water quanta. I'll admit it's mostly just fine tuning what I'm suggesting though. I like the concept, but the upgraded version might need a higher cost (like 5). Take pulverizor... This deals 3 less damage and costs the same, but its ability is of the same element (which is a big deal) and you can have more than one in play without a two card combo. I'm not sure the fact that the permanent is only disabled for three turns justifies this. I too can see this being broken. Get 8 aether, 6 life, and you get about 6 5/2 cards plus the 30 on average damage from the initial ball lightnings. Per fractal. And if this card stacks... then with 8 aether, 10 life, it'd be 12 5/2 cards plus the 30 damage on average. Granted, 4 card combo. And as Elite Arbiter says, it gets worse with the upped version. All you need is 4 life, 8 aether, and you'll get 5 7/2 creatures for three cards. And more for every fractal (plus each fractal adds +2/+2 on to existing ones). Hi killfer. I sort of recently resurfaced too. Okay not really recently but whatever. General Discussion / Re: Is this game worth playing? You obviously haven't heard of False Gods if you think bot awards are too small. In other words, yes, it gets better. Once you start farming False Gods it's fairly difficult, but eventually gets better. Part of what makes this game so great is the community, so since you've already found that it's a step in the right direction. 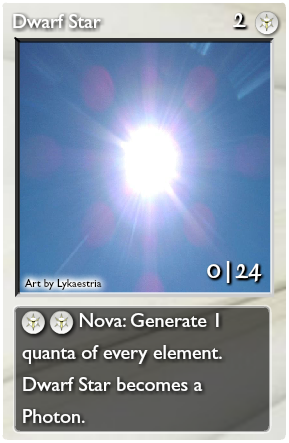 Nova: Generate 1 quanta of every element. Dwarf Star becomes a Photon. Supernova: Generate 2 quanta of every element. Giant Star becomes a Ray of Light. Was considering adding on one damage to every creature unupped, two upped, but decided not to partly because it wouldn't fit on the card.